One of the primary rarities in the entire Hard Times tokens series will cross the auction block in our Philadelphia Americana Sale, to be held in the City of Brotherly Love, September 17 through 22, 2013. A diverse offering of coins, medals, tokens, and other numismatic delights will be offered in Philadelphia, including Part XXIV of the legendary John J. Ford, Jr. Collection. The token in question, an 1836 Huckel, Burrows & Jennings issue from St. Louis, Missouri, is designated Low-102, HT-187, and is given a Rarity-7+ rating among today’s numismatists. This plain edge brass token is one of only four thought to exist, a figure that includes an example permanently impounded in the collection of the American Numismatic Society. The MS-61 designation from NGC for this specimen certainly puts it in the running for the finest known example of its type. And, you can’t top the pedigree – the Brand Family, New Netherlands Coin Co., Inc., F.C.C. Boyd, John J. Ford, Jr., and the Dice-Hicks Collection. As near as we can tell from our research, an 1836 Huckel, Burrows & Jennings token has only been offered three times in the past 100 or so years, including the present specimen which has come to market on more than one occasion during that span. It was offered by us (Stack’s) in Part IV of the famous John J. Ford, Jr. Collection in 2004, and a few years later in the incredible Dice-Hicks Collection of 2008; another specimen was sold by Joe Levine in 1976. As the only Hard Times issue from St. Louis, the present piece would be in great demand even if it were somewhat more common. “Common,” however, is one thing this 1836 token will never be! Very few collections, past or present, could boast of an 1836 Low-102 – even many of the greatest cabinets of Hard Times tokens ever formed were lacking this rarity. If you are nearing the end of your Hard Times token collection and lack just a few rare pieces, we suspect that Low-102 is among the pieces missing. One bold bid on your part can remedy that situation. We hope to see you in Philadelphia with your bidding paddle raised high when this treat crosses the auction block. 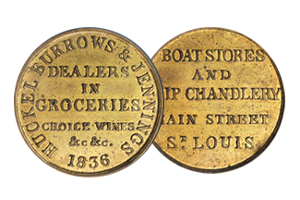 “Rare 1836 St. Louis, Missouri Hard Times Token To Appear In Our September 2013 Philadelphia Sale,” Stack’s Bowers Galleries, accessed August 31, 2013, http://stacksbowers.com/Blogs/united-states-coin-of-week-rare-1836-st.html.